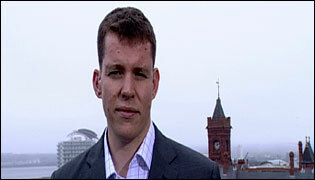 Rhun ap Iorwerth fronts the Politics Show in Wales as part of his new role as BBC Wales' Chief Political Correspondent. Having only just made it into his thirties he hopes to bring a fresh edge to the programme. Rhun has covered Welsh politics for the BBC for over eight years, spending three years at Westminster before returning to Wales after the devolution referendum in 1997. For the past two years Rhun co-presented BBC Radio Cymru's breakfast news programme 'Y Post Cyntaf'. He gave that up to take on his new role, and Rhun doubts he'll miss the 5am starts, though working Sundays is the trade-off! Like Jeremy Vine, Rhun was also a singer in a band, but is limited to karaoke nowadays. The dream is still alive, though! He is more likely to be found chasing after his two young daughters, whose interest in politics is as yet undeveloped. Being just 2 and a half and eight months old, they can be forgiven for that. Join Rhun on The Politics Show every Sunday at midday on BBC One.